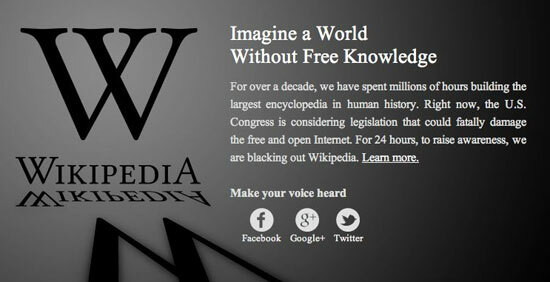 You may have noticed Wikipedia’s unprecedented blackout today, in opposition to SOPA and PIPA. WordPress.com and other sites have also joined in the protest. Enable copyright holders to seek court orders against websites accused of enabling or facilitating copyright infringement. Search engines could then be required to remove links to such sites, and the companies that provide your Internet service could be ordered to block access to them. Make the unauthorized streaming of copyrighted content a crime, with a maximum penalty of five years in prison for ten such infringements within six months. Give immunity to Internet services that voluntarily take action against websites dedicated to infringement. Make websites liable for the comments and actions of their visitors. From a free speech perspective, the problem can be stated simply. The bills are not limited; they’re sledgehammers not scalpels. They do not, as often advertised by the copyright industry, merely target foreign “rogue” sites like the Pirate Bay. They are not even limited to sites guilty of any copyright infringement, direct or even contributory infringement. Instead, the bills would extend not only to foreign but also to domestic websites that merely “facilitate” or “enable” infringement. Thus, in their language, the bills target considerable protected speech on legitimate sites such as YouTube, Twitter, and Facebook. The bills also affect non-infringing speech by search engines, advertisers, and domain name providers. Coupled with this overbroad scope, the bills authorize remedies that lack the usual procedural safeguards, ensuring that even more protected, non-infringing speech will be restricted. Even though a judicial determination is generally required to remove speech from circulation, the House version empowers copyright-holders to send notices to payment processors and advertisers to shut off funding for non-infringing sites that meet the bill’s broad definitions. The bills also encourage over-enforcement by making companies immune from suit for mistakenly punishing sites outside even the bills’ over-expansive scope. 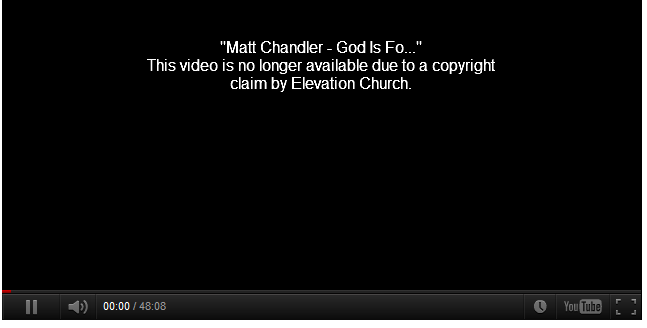 What’s bad for free speech is bad for sound doctrine. In the battle for ideas, the ability to discuss those ideas freely is critical. And free discussion requires the freedom to reference and quote opposing voices. Christian websites, blogs and radio programmes depend upon being able to make fair use of copyrighted content for the purposes of comment and criticism. Our ability to stand up for sound doctrine will be severely impaired if we cannot freely quote, embed or link to the copyrighted sermons, articles, books and videos of today’s false teachers. Imagine, for example, if Chris Rosebrough had to obtain permission from the copyright holder every time he reviewed a sermon on his Fighting for the Faith radio show, to avoid being guilty of ‘the unauthorized streaming of copyrighted content’. Chris would simply not be able to do his work of critiquing error and using it as a foil for teaching Biblical truth. Your opposition to SOPA and PIPA – and any similar future legislation – is vital. If you live in the US, please contact your Congressional representatives today. Google also has a petition that you can sign. We are no longer IN DANGER of losing our republic. It’s been gone for a decade! If not SOPA & PIPA, then something else fairly soon. Understand that ours is no longer a free constitutional society. Ten years after the death of the republic, we are now witnessing its decomposition. Secession is the answer. Build anew.